According to DOC, ‘Marine reserves are areas of sea and foreshore where all marine life is totally protected. They are the national parks of the marine world and fishing, shellfish gathering and any other disturbance of marine life is strictly prohibited’. The reserve is home to many rare birds and a critical breeding habitat for much of our marine food chain. Protecting such areas also helps to sustain populations of fish species, like snapper, the most popular recreational species in the Hauraki Gulf. It inherently also means that water quality is protected. At least you could reasonably expect that to be the case. The Long Bay Marine Reserve was established in 1995, in order to protect the area around one of Auckland’s most popular beaches. The Department of Conservation selected it as an Area of Significant Conservation Value (ASCV). Each year, the beach and the neighbouring Okura Bush walk are visited by over a million visitors, with peak days seeing over 20,000 people there. Until recently, the backdrop has been green, with only the occasional house to be seen. But over the past 3-4 years, massive earthworks have been started to support development of thousands of houses in both the Long Bay valley and Weiti station behind Dacre Cottage at Karepiro Bay. In order to prevent some of the Weiti station run-off (featured on ONE News on Monday evening), and in contravention of a resource consent (Permit 34156), developers have actually dammed one of the streams draining the salt water wetlands at Karepiro Bay. The wetlands are now becoming the developers’ sediment ponds, while the area is home to many rare waders like the New Zealand dotterel and the furtive banded rail. Impacts are unknown but getting worse daily. Imagine then further just how serious this will become if Todd Corporation is allowed to develop intensive housing between Long Bay and the Okura Estuary. We can wave goodbye to the Marine Reserve and clean swimming at Long Bay. And the public consultation/notification by Council? There was none. What about monitoring & reporting for this site? Well, this is supposedly undertaken monthly by Council. We have copies of two such reports from June and July 2016 (so, compiled even before the site status changed from Clean to Managed), in both of which, the Council cites serious breaches to consent. No penalties were applied. No further action was taken. Council monitoring reports for August to November 2016 were ‘unavailable’, Council staff being “unable to attend the site due to health and safety reasons”. Subsequent reports have also proved hard to obtain. By implication, the Auckland Council considers it acceptable for heavy metals to leach into the Long Bay Marine Reserve, where a million Aucklanders swim every year and beyond that into fish that swim the Hauraki Gulf and are eaten by many of us. 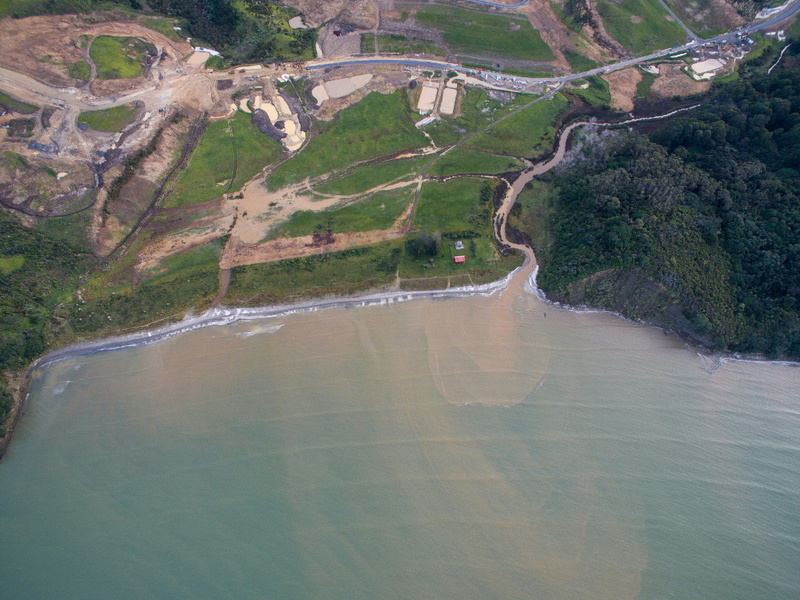 In August 2017, the Hibiscus and Bays Local Board produced a report (authored by the same Mr Kerry Flynn) stating that sediment run-off from Envirofill must be within ‘acceptable levels’; no definition of ‘acceptable’ is offered. Further “there is no requirement contained within the resource consent granted to test for contaminants leaching from the site”. Really? Why? To make us feel really safe the report tells us that “Envirofill has kindly commissioned its own professional independent consultant to inspect the site on a regular basis. This is currently done weekly.” Great. So where are the reports? The poacher is monitoring his own activities and Council is acquiescent. An independent analysis of the reports we did manage to obtain, was commissioned by a number of concerned groups. It shows excessive levels of heavy metals (nickel, zinc, cadmium, chromium and copper) in the upper Okura catchment below Envirofill. According to the report, monitoring and reporting methodologies applied by the Council are wholly inappropriate for protection of aquatic ecosystems and reported levels are many times higher than recommended safe levels (it’s easy to confuse the issue by reporting in ‘grams per cubic metre’ instead of ‘micrograms per litre’, as has been done – to us lay folk, that’s unintelligible gobbledegook but Council ‘experts’ should know better. Maybe it’s not in their interests to do so…). The Long Bay-Okura Marine Reserve is under very serious threat. The level of run-off and pollution is being concealed by Council staff (whether through deliberate acts or ineptitude is unclear). One of Auckland’s coastal jewels – important for people, marine life and birds – is at risk of permanent destruction through inappropriate consents and incompetently managed development. Our Labour-led Council is turning a blind eye to the inconvenient truth. DOC is disorganised and does nothing to prevent it. Ignorant and irresponsible developers continue to destroy our environment. At a time when both major political parties are making their separate stands regarding water quality around New Zealand, surely these issues need to be addressed, developers and Council held to account and the Long-Bay-Okura Marine Reserve afforded the protection it merits. Friends of Okura Bush (FOOB) is a registered charity comprised of volunteers, who are passionate about the preservation of our natural world. It is our mission to protect and enhance the biodiversity or flora and fauna to be found in this precious patch of remnant coastal bush alongside the Okura Estuary.